It consists of two identical hubs made of C45 steel or EN-GJS500-7 cast-iron in standard version, depending on the size. 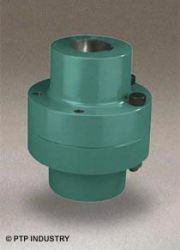 The axial attachment of the hubs uses the standard tapped hole of the gear unit shaft end. A piece of wire (not supplied) fastened on a socket head screw ensures simple but safe locking of the attaching screw. The two hubs are assembled with standardized hardware in compliance with the EN 24010 and DIN 980 V standards. The range of HARCO couplings includes 11 sizes, with nominal torques corresponding to our speed reducers. The extensive rigidity of the HARCO coupling allows for the extension of the reducer output shaft without the need of an intermediate bearing block. It is particularly suited for vertical applications such as surface aerators and agitators. Its torque range varies between 1 600 and 100 000 Nm.